C2C Gallery is in South Korea! As a gallery created by a very talented potter (that sweet wife of mine), we have an extensive inventory in almost every ceramic style. There are so many options: clay, glazes, and techniques that it can make your head spin. The puzzle of pottery for me is that wherever human beings found clay they used it for practical purposes, art, religious and my fave…..storing wine. We did this as we have done with so many other key components to our lives, controlling fire, weapons and on and on. The idea and creation didn’t happen by sharing info. It happened…………heck, I have no idea how all of those exact same things could have been created so independently. 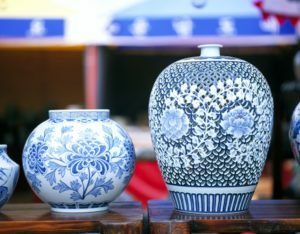 In Korea, there is a long history dating back 30,000 years of potters. As many of you know, we have big fun on our First Friday events. A customer sent us a great little note. 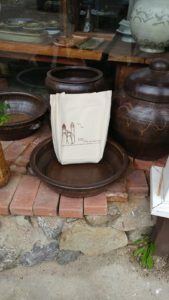 She had moved to South Korea and is exploring the pottery tradition there. She was kind enough to think of us and sent this note with a picture. We are worldwide now…..at least our bags are! This world is but a canvas… tribute to the artists participating in ArtPrize and ArtWalk.